The great British pub is almost dead and I, for one, am unhappy. A few weeks ago, I visited Avebury’s The Red Lion Inn – the only pub within an ancient stone circle, built during the 1600s. Ten years ago, it was impossible to leave without having been filled with great cask ale, honest pub grub and scintillating conversation with nomads, druids, vagabonds, spiritualists and hikers. Now, having been taken over by Old English Inns, the pub’s décor has about as much charm as Donald Trump, and a menu that’s rich with all sorts of pies, burgers and steaks. A boring choice, indeed, but how could anybody resist the monthly special of a rump steak with all of the trimmings on offer for £5? Had I known that the steak would be so gratuitously overcooked that it texturally resembled a piece of old shoe leather, I would have declined and favoured a liquid dinner of the pub’s own brew ale that’s watery and lifeless, at best. Some weeks earlier, while driving through the Somerset countryside on a warm Sunday afternoon, I’d imagined that an old country pub with remarkable ales, a seasonal British menu without the words ‘artisan’ or ‘gastro’, a fireplace and maybe a resident dog wouldn’t have been too difficult to track down. After some brief research I stumbled across a local haunt that had finished serving food indefinitely, and upon asking where I may find some quality pub grub; the landlady (backed by a handful of locals propping up their bar with pints of warm Carlsberg) insisted that I try the local branch of Wetherspoons. It’s upsetting to find that the Great British pub is so difficult to find in 2016, what with so much competition and so many drinking dens (especially in London) having fallen victim to high rates. So it’s unsurprising that rapidly increasing number of watering holes have submitted to venture capitalist buy outs, stripping venues of their soul and selling oversized “gourmet burgers” on blocks of wood that belong in the non-existent fireplaces. Set over three floors, Walkers of Whitehall has recently reopened after an interior refurbishment. First opened in 1694 as a bank, the pub is tucked away on a side street at the Charing Cross end of Whitehall. Unassuming from outside, the ground floor has a vast bar space that was practically empty on a Friday lunchtime, as was the downstairs dining space in the old bank vaults, looking so freshly decorated that the walls could still have brandished wet paint. Walkers of Whitehall is so tucked away, in fact, that it wasn’t until we’d paid in excess of £10 for two pints of untrendy Guinness next door in the Silver Cross that we realised we were in the wrong pub. As for the food, the lunchtime menu at Walkers is refreshingly adventurous and aside from the obvious cheeseburger, sirloin steak, and fish and chips: a number of dishes that sound genuinely exciting are on offer. “Do you actually know what N’duja is?” Our waiter asked, conceitedly assured that neither of us had met the acquaintance of spreadable, spicy Italian sausage. These particular croquettes forming part of the starters section had been breaded and lightly fried, accompanied by a garlic-heavy aioli to contrast the spice of possibly the best N’duja I’ve eaten outside of Italy. A classic choice, my companion’s pork and pistachio terrine was executed very well, favouring fatty cuts of pork, though a little more than the one or two token pistachio nuts would have been welcome. A salad of fashionable bulgar wheat came with an additional topping of gently roasted chicken with shaved fennel and chard. The dish sated my companion but wasn’t particularly exciting. Conversely it is my main course that was most interesting by quite some distance, with the lamb kebab having been insistently recommended over the more expensive grilled plaice with capers and brown butter. Although advertised as lamb shish, four hunks of kofte formed from spiced minced lamb had been grilled with a surprising glimmer of pink running throughout, much to my delight. These were served on a fluffy flatbread that had also been grilled and sprinkled with an assortment of spices and chopped herbs with smears of minted yoghurt. Not only was the presentation simple but strangely alluring, this posh kebab was magnificent, no matter how seemingly out of place on the menu of a pub dining room. Desserts were fine, but generally forgettable, though the cocktail list is worth a look at with the maple old fashioned arriving in a little smoke-filled bottle hogging most of the attention, and quite rightly so. During our lunchtime visit, Walkers of Whitehall was sadly empty with the newly refurbished dining room seeming less homely than corporate and showy. 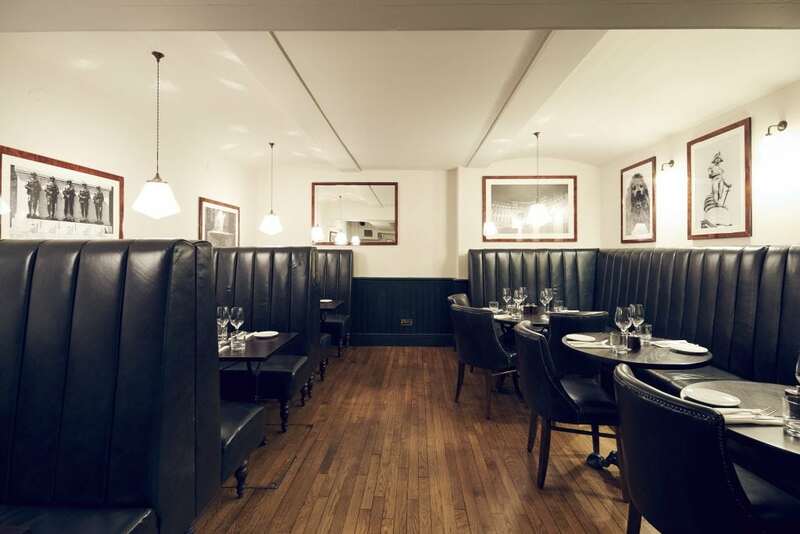 While the food served is by no means the warming quintessential pub fare of yesteryear, the contemporary menu offers some very good, reasonably priced food. Still, my personal quest for the dying breed of perfect pubs continues. Walkers of Whitehall can be found at 15 Craig’s Court, London, SW1A 2DD.